Evaluating CAR expression is an essential step in the production of CAR-T cells. This is often done by flow cytometry, using protein L, anti-Fab antibodies or target antigens as detection antibodies. Among these common choices, target antigens are widely considered to be the best option, because it offers high specificity and minimal background staining. Specifically bind to the antigen-binding domains of CARs. Binds to the kappa light chain of immunoglobulin. Binds to the Fab portion of immunoglobulin. Please feel free to contact us by cart@acrobiosystems.com if you have any questions. Reagents:Biotinylated human BCMA protein, Fc & Avi Tag (ACROBiosystems, Cat. No. BC7-H82F0);PE Streptavidin (Biolegend, Cat. No. 405204). Samples:Anti-BCMA CAR-transduced human primary T-cells. 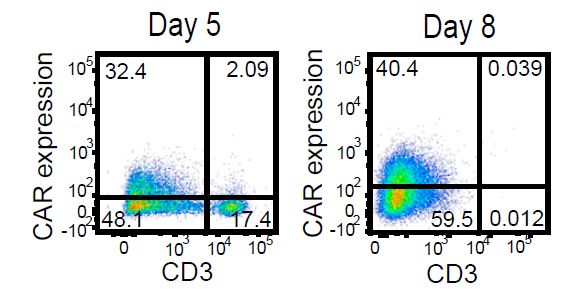 1.Transduce human primary T-cells with a lentiviral vector to express anti-BCMA CAR;2.Three days post-transduction, cells were stained with a biotinylated human BCMA protein (ACROBiosystems, Cat. No. BC7-H82F0);3.After washing, secondary labeling was performed with PE Streptavidin;4.The cells were analyzed using BD FACSCaliburTM flow cytometer, and the data was analyzed with FCS Express 6 Plus software. Results:The data showed that the expression of anti-BCMA CARs on transduced T cell surface from donor 1 and donor 2 were 52.72% and 73.49%, respectively. Reagents:Biotinylated human CD19 protein, Fc Tag (ACROBiosystems, Cat. No. CD9-H8259);FITC Streptavidin (Biolegend, Cat. No. 405201). Samples:R1013-C6 cells (Transfected 293 cells expressing the anti-CD19 [FCM63] scFv & RFP tag). 1.Transfect Expi 293 cells with a mammalian expression vector to stably express anti-CD19 [FCM63] scFv & RFP tag. The resulting stable cell lines are named as R1013-C6 cells;2.Cells were stained for CAR expression using a biotinylated human CD19 protein (ACROBiosystems, Cat. No. CD9-H8259);3.After washing, secondary labeling was performed with FITC Streptavidin;4.The cells were analyzed using NovoCyteTM flow cytometer and the data analyzed by ACEA NovoExpress software. Results:The data showed that the binding of biotinylated human CD19 (Cat. No. CD9-H8259) to anti-CD19 scFv-modified cells was specifically mediated by anti-CD19-CAR and CD19 interaction. 293 cells were transfected with FCM63-scFv and RFP tag . 2x105 of the cells were first incubated with A. Biotinylated protein control. B. Recombinant biotinylated human CD19 (Cat. No. CD9-H8259, 10ug/ml ) . C. Recombinant biotinylated human CD19 (Cat. No. CD9-H8259, 10ug/ml) and FMC63(Mouse anti-CD19 antibody). FITC Streptavidin was used to analyse with FACS. RFP was used to evaluate CAR(FMC63-scFv) expression and FITC was used to evaluate the binding activity of recombinant biotinylated human CD19 (Cat. No. CD9-H8259). Reagents:Biotinylated human CD19 protein, Fc Tag (ACROBiosystems, Cat. No. CD9-H8259);PE Streptavidin (Biolegend, Cat. No.405204);Brilliant Violet 711™ anti-human CD3 Antibody (BioLegend, Cat. No.300463). 1.Activated T cells were electroporated with TRC1-2 mRNA and transduced with AAV:TRAC:CAR at an MOI of 400,000 vg/cell and cultured for 5 days in the presence of IL-2;2.Five days post-transduction, cells were stained for expression of the CAR using a biotinylated human CD19 protein (ACROBiosystems, Cat. No. CD9-H8259) followed by PE Streptavidin and CD3 using a Brilliant Violet 711™ anti-human CD3 Antibody;3.The cells were analyzed using BD Fortessa flow cytometer and the data analyzed by FlowJo software. Results:Analysis of CD3 and CAR expression by flow cytometry showed a high frequency of CD19 CAR+ cells in the CD3- population.. Activated T cells were electroporated with TRC1-2 mRNA and transduced with AAV:TRAC:CAR at an MOI of 400,000 vg/cell and cultured for 5 days in the presence of IL-2. Five days post-transduction, cells were stained for expression of the CAR using a biotinylated CD19-Fc reagent and CD3, with TRC1-2-treated, mock-transduced cells used as a control for gating of CAR expression. CD3+ cells were then depleted. Enriched CD3- cells were cultured for 3 additional days in the presence of IL-15 and IL-21 and then analyzed again by flow cytometry for CD3 and CAR expression. Reagents:Human CD19 protein, His Tag (ACROBiosystems, Cat. No. CD9-H52H2);FITC anti-6xHis tag antibody (Abcam, Cat. No. ab1206). 1.Transfect Expi 293 cells with a mammalian expression vector to stably express anti-CD19 [FCM63] scFv & RFP tag. The resulting stable cell lines are named as R1013-C6 cells;2.Cells were stained for CAR expression using a human CD19 protein, His Tag (ACROBiosystems, Cat. No. CD9-H52H2);3.After washing, secondary labeling was performed with FITC anti-6xHis tag antibody;4.The cells were analyzed using Accuri C6 flow cytometer and the data analyzed by FCS Express 6 Plus and GraphPad Prism 5 software. Results:The data showed that the binding of human CD19, His Tag (Cat. No. CD9-H52H2) to anti-CD19 scFv-modified cells was specifically mediated by anti-CD19-CAR and CD19 interaction. 293 cells were transfected with FMC63-scFv and RFP tag . 2x105 of the cells were first incubated with A. His Tag-protein control. B. Recombinant human CD19, His Tag (Cat. No. CD9-H52H2, 10ug/ml). C. Recombinant human CD19, His Tag (Cat. No. CD9-H52H2, 10ug/ml) and FMC63(Mouse anti-CD19 antibody). The FITC Anti-6xHis tag antibody was used to analyse with FACS. RFP was used to evaluate CAR(FMC63-scFv) expression and FITC was used to evaluate the binding activity of recombinant human CD19, His Tag (Cat. No. CD9-H52H2) . Reagents:Human CD19 protein, Fc Tag (Acrobiosystems, Cat. No. CD9-H5259);FITC anti-human IgG Fc antibody (Biolegend, Cat. No. 409310). 1.Transfect Expi 293 cells with a mammalian expression vector to stably express anti-CD19 [FCM63] scFv & RFP tag. The resulting stable cell lines are named as R1013-C6 cells;2.Cells were stained for CAR expression using a human CD19 protein, Fc Tag (ACROBiosystems, Cat. No. CD9-H5259);3.After washing, secondary labeling was performed with FITC anti-human IgG Fc antibody;4.The cells were analyzed using NovoCyteTM flow cytometer and the data analyzed by ACEA NovoExpress software. Results:The data showed that the binding of human CD19, Fc Tag (Cat. No. CD9-H5259) to anti-CD19 scFv-modified cells was specifically mediated by anti-CD19-CAR and CD19 interaction. 293 cells were transfected with FCM63-scFv and RFP tag . 2x105 of the cells were first incubated with A. Human Fc tag control. B. Recombinant human CD19,Fc Tag (Cat. No. CD9-H5259, 10ug/ml). C. Recombinant human CD19,Fc Tag(Cat. No. CD9-H5259, 10ug/ml ) and FMC63(Mouse anti-CD19 antibody), followed by FITC anti-human IgG Fc antibody, and then analyzed using NovoCyteTM Flow Cytometer. RFP was used to evaluate CAR(FMC63-scFv) expression and FITC was used to evaluate the binding activity of recombinant human CD19,Fc Tag . Reagents:Human CD19 Protein, Fc Tag (ACROBiosystems, Cat. No. CD9-H5259);Human CD19 Protein ,Fc Tag (Company N);Human PD-L1 Protein, Fc Tag (ACROBiosystems, Cat. No. PD1-H5258), as negative control;FITC anti-human IgG Fc antibody (Biolegend, Cat. No. 409310). Cells:R1013-C6 cells (Transfected 293 cells expressing the anti-CD19 [FCM63] scFv & RFP tag); Expi 293 cells; Jurkat E6.1 cells. 1.Cells were stained for CAR expression using ACRO’s human CD19 protein, Fc Tag or Company N’s human CD19 protein, Fc Tag;2.After washing, secondary labeling was performed with FITC anti-human IgG Fc antibody;3.The cells were analyzed using NovoCyteTM flow cytometer and the data analyzed by FCS Express 6 Plus and GraphPad Prism 5 software. Results:The data shows that Company N’s human CD19-Fc fusion protein exhibits strong non-specific binding to 293 and Jurkat cells. FACS analysis of human CD19 protein, Fc Tag (ACROBiosystems, Cat. No. CD9-H5259) binding to A. R1013-C6 cells, B. Expi 293 cells, C. Jurkat E6.1 cells. Cells were first stained with human CD19 protein, Fc Tag (ACROBiosystems, Cat. No. CD9-H5259) followed by FITC anti-human IgG Fc antibody, and then analyzed using NovoCyteTM Flow Cytometer. The data were analyzed with FCS Express 6Plus and GraphPad Prism 5 software. FACS analysis of human CD19 protein, Fc Tag (Company N) binding to A. R1013-C6 cells, B. Expi 293 cells, C. Jurkat E6.1 cells. Cells were first stained with human CD19 protein, Fc Tag (Company N) followed by FITC anti-human IgG Fc antibody, and then analyzed using NovoCyteTM Flow Cytometer. The data were analyzed with FCS Express 6Plus and GraphPad Prism 5 software. MacLeod DT, et al., 2017, Mol Ther. 25(4):949-961.doi: 10.1016/j.ymthe.2017.02.005.